Freeport, Grand Bahama Island is an island with lots of dive sites, a true diver's paradise. I will try to give you a brief description of some of these sites. The island has three reef lines; the first is shallow, 10-20ft,. it is a solid reef that runs the length of the islands south shore. 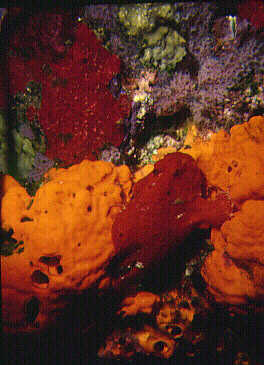 (as do all the reefs here) It is a very colorful reef with lots of life but I would only recommend it on very nice days. If it is rough there is a strong surge and the bottom will be stirred up bringing the visibility down. The second reef is a med. depth, 40-60ft., it is made up of scattered coral heads on sand flats; again lots of reef life but you also have the sand to explore and lots of rocks to look under. The third reef line is deep 60-90ft. and like the shallow reef it is a solid reef mass. On some of the deep sites the surge channels have overgrown forming tunnels. 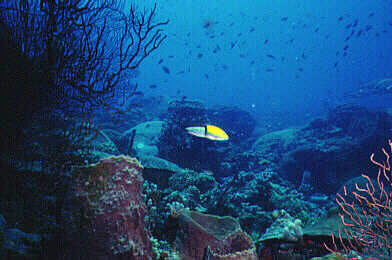 The deep reef is also where you may see some of the larger fish. There are many sites along these reefs to pick from, most are very good. 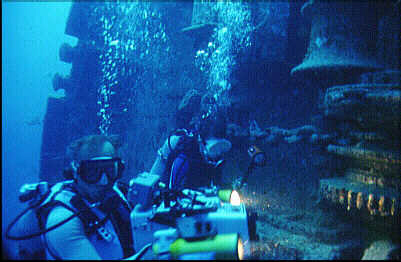 The island also has several wrecks to dive. The best is Theo's wreck. It is a 230ft. cement freighter sitting in 110ft. of water right on the edge of the ledge, a 2000ft. drop off, you should try to do this one. You can also do some special dives here like diving with dolphins and shark feeding dives. For these special dives I would recommend booking well in advance as they are always full!